I'm not going to lie, the build quality of this one is probably on par with other mirrorless cameras that are made in China or Thailand, but nowhere near the ones are made in Japan like the X-T2 or even the made in Vietnam Olympus OM-D E-M5 II. It's not as bad as the X-A3 though. 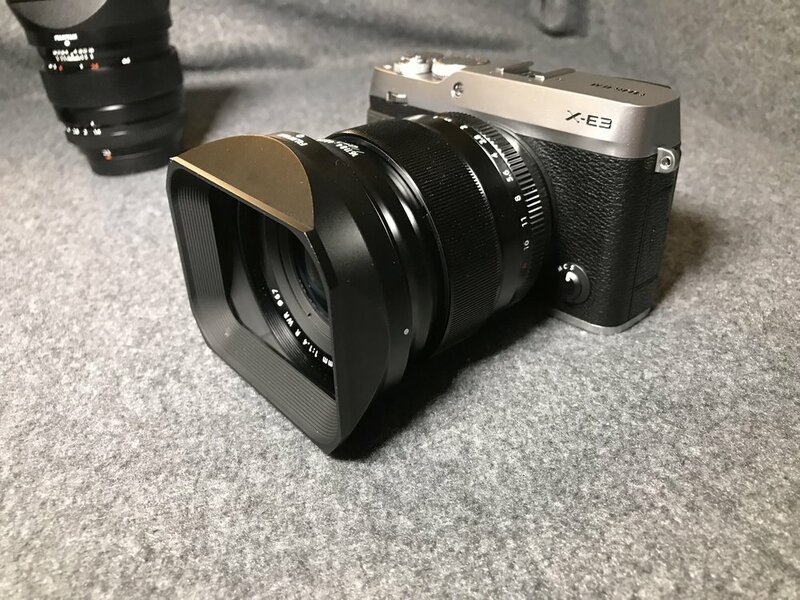 It's great that the top and bottom parts of the X-E3 are made of metal, the body is mostly wrapped in the grippy leathery plastic anyway, so you won't be able to feel it. The dials feel closer to the ones on the X-T10 than the X-T2. The shutter feels like the ones on the X-T10 and X-T20, which is to say, rather cheap. I have a feeling that these 1/4000s shutter mechanisms use an electromagnetic mechanism rather than a mechanical one on the X-T2. Nothing wrong with it, it just gives a sense of scraping instead of a satisfactory slap. Having said that, it's a camera I'll still be happy to use as a daily driver when I'm not shooting birds, wildlife or serious landscapes in sub-zero temperatures as I greatly value the reduced volume and weight over my X-T2. The electronic shutter works great when using large aperture lenses in bright daylight. The X-E3 was designed to be compact and portable. However it has a very pronounced thumb grip that holds the AF-L and Quick Menu buttons. With my former X100T, I had to use a thumb grip on the hot shoe to get a more comfortable grip. With the X-E3, I can apply a fair bit of sideways pressure on it with my thumbs, such that it makes the grip a lot more secure. This makes larger lenses like the XF16-55mm or even the XF50-140mm easy to handle. The X-E3 trades the traditional D-pad for a joystick, and I love it. Navigating menus or changing focus points are much quicker for me. If I were to nitpick, the joystick tends to apply some pressure on the top right of the LCD, causing a very slight discolouration when you push it to the left. This is probably due to the plastic construction of the body itself, which again, I'm more than happy to accept for a lighter body. The capacitive touchscreen took some getting used to. In shooting mode, I find the tap to focus function responsive and capable. You can also use the touch screen to shift focus points when composing through the viewfinder, I did not find this to be useful as you have to swipe too many times to get the focus point across the frame - might as well use the joystick. In playback mode, you get the standard swipe to change images and pinch to zoom in. The implementation is nowhere as finessed as the first iPhone, but still a welcome addition. What's quite clever is that double-tapping on an image takes you to a magnification of the focus area and double tapping again takes you out of zoom mode. What's annoying is that you do not get full magnification with RAW files, only a slightly zoomed in version. This is a problem with all Fujifilm cameras. JPEGs give you full magnification. You can buy the X-E3 with the excellent 18-55mm, and it feels at home on the body. I will however, be using this with the XF16mmF1.4, XF23mmF1.4 and the XF56mmF1.2. The camera feels like it handles well with the three of them, even with the LH-XF16 and the LH-XF23 attached to the first two. The XF16-55mm feels huge on it, but its smooth zoom ring makes the handling feel like a non-issue. The XF50-140mm strangely feels at home when you remove its tripod mount. I can foresee myself carrying it out even more on daily shoots and travel with the X-E3. The XF100-400mm fits on it, why not? The Bluetooth feature is a first for Fujifilm cameras and is primarily used for pairing your smartphone to the camera. I can write an entire post on this so I'm going to just give you the brief points for now. Your camera will ask you to register a smartphone on first boot. After first pairing, the camera even asks if you want to synchronise the time. Yes please! There's now a Bluetooth indicator. There's a new Image Transfer Order concept, where you can boss your X-E3 around and "order" it to add images to be transferred to a queue. You can choose to automatically add all images taken to this queue, or add them separately by pressing AF-L when in Playback mode. 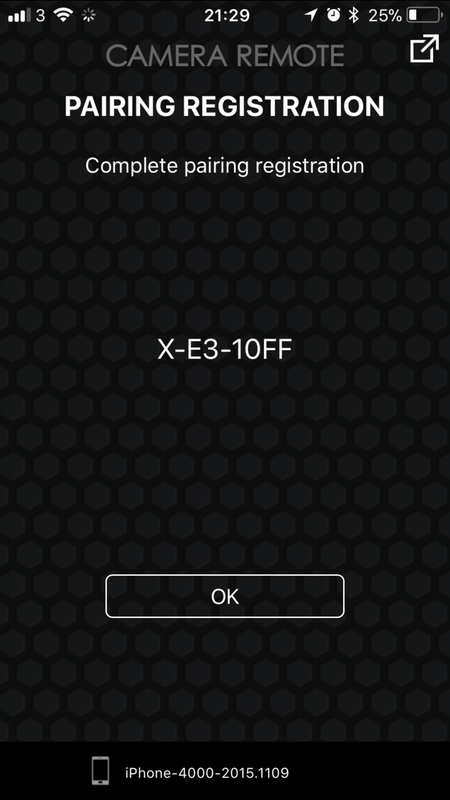 Your X-E3 will take orders, if you can figure out the interface. Switching the camera off with image in the queue gives you a reminder to complete the transfer. You also get a push notification on your phone reminding you to connect to the camera's wireless network. Transfers happen in the background and notify you when done. Each time you switch the camera off with images in the queue, it automatically broadcasts its wireless network for a few minutes and you get a local push notification on the phone, reminding you to connect to the camera. The transfers happen in the background once you connect to the camera's wireless network, no need to launch the app. The camera offers to sync the date and time with your smartphone on first sync. It would be great if this could happen whenever I travel overseas. You can't transfer RAW images. Come on Fujifilm, even Sony knows how to convert RAWs to JPEGs before a transfer. You have to connect to the camera's wifi in the phone's settings menu each time you do a transfer. There is no GPS tagging functionality over bluetooth, you'd think that this would be one of the low-hanging fruit given the currently near-useless implementation of GPS tagging. I can foresee myself using this feature more, especially since I can build a queue on the camera (assuming I shoot JPEGs) and just let it transfer in the background. Some of the questions I've been asked will make it into the full review, but you can check the answers below. Feel free to let me know in the comments if you have any questions. Can the shutter speed go beyond 30s in T mode? Yes it can go up to 15 minutes. Can you do exposure bracketing with RAW images? Does it alert you of clipped highlights? Yes it does, both in live view and playback mode. Can you use the electronic shutter to shoot RAW images? You need to turn off the electronic shutter to access the extended ISOs. Are the extended ISO settings available in RAW? Does it have a built in ND filter? No it doesn't but the electronic shutter helps a lot. Should I buy the X-E3? If you're looking for a compact X series for travel and everyday photography, I can't think of a better model. The footprint of this package is so small that I can just toss it into my Peak Design Everyday Sling and have it occupy less than third of the space. If you're looking for a serious camera for tripod and professional work, this will not be the camera for you. I would recommend getting the X-T2 instead for the reasons below. The Fujifilm X-T2 has a few things that may break your deal if they matter enough for you, do note that this comes at a weight penalty of 170g (507g for the X-T2 vs 337g for the X-E3) and an added cost of about US$700. 1/8000s max. shutter speed might matter to you if you shoot outdoors with wide apertures and moving subjects often. Tripod mount that's aligned with the centre of the lens, important if you want to shoot video on sliders with rotation. 2 SD card slots that give you redundancy. The last thing you'd want to happen when shooting professionally is to lose all your images due to a failed SD card. UHS-II SD card slot that empties the buffer quickly, vital for wildlife photography. It can shoot 4K video continuously for 30 minutes with the VPB-XT2 attached, the X-E3 can only do so for 10 minutes continuously. Sample photos to come when Lightroom adds support. Those are my first impressions of the X-E3. Despite some of its shortcomings, I can't wait to take it out and have the fantastic new 24MP sensor with me in such a small package. Check back for more content over the next few days. You can also read about my recommended settings here. Meanwhile you can let me know in the comments if you'd like me to answer any questions you may have on it. Follow me on social media below to keep updated when I post the full review. If you found the content in this post useful, please consider supporting me by using one of the links below. Using any of the face or eye detect options seem to cause the live view to flicker. I initially thought this was due to a mix-up in fluorescent frequency, but found that it happens outdoors too. You can watch this in the video below. Hopefully Fujifilm fixes this through a firmware update. I've tried it with multiple lenses now and can reproduce it under the conditions below. Sign up with your email address to receive updates on photography and tech. Thank you! Please check your e-mail inbox for the confirmation e-mail, it might have been caught by your spam filter!